Hyundai will even bring an N performance model to the US. Hyundai teased the 2019 Veloster leading up to its big reveal at the 2018 Detroit Auto Show, but it's finally pulled the wraps off of it and we think that it has finally become the Korean hot hatchback that we have always dreamed of. We'll start with the biggest news, which is the arrival of the new Veloster N. This high performance model is the first Hyundai N model that will available in the US. The Veloster N shares a drivetrain with the i30N, which is a European model that we have been desperately asking for. Like the i30N, Hyundai showed off the Veloster N in a stunning baby blue color (called Performance Blue) with red accents. The Veloster N is fully differentiated from standard models on the exterior with an N-design rear spoiler, rear fascia design with integrated diffuser, and high-flow dual exhaust. The N model uses 225/40R18 Michelin Pilot SuperSport summer tires for the 18-inch wheel design and exclusive-compound 235/35R19 Pirelli P-Zero summer tires for the available 19-inch alloy wheels. The interior is also unique with N-design front cloth sport seats with performance-focused bolstering, N-design steering wheel, shift knob, N-logo door sill plates, and N-design instrument cluster. Under the hood sits a 2.0-liter turbocharged four-cylinder with up to 275 hp and 260 lb-ft of torque. We assume that like the i30N, the Veloster N will also be available in a 247 hp state of tune. This makes it a nice rival for cars like the Volkswagen Golf GTI and Ford Focus ST, and a middle ground rival for the Golf R, Focus RS and Honda Civic Type R. All N models will come with a six-speed manual transmission with four exterior colors including Ultra Black, Chalk White, Racing Red, and N-exclusive Performance Blue. The Veloster maintains its unique three-door, asymmetrical layout with a completely refreshed design. The N model also features an N Grin Control System drive mode selection system with Normal, Sport, N, Eco and N Custom modes. These modes can change engine throttle response, engine speed rev-matching, exhaust note, active differential tuning, suspension damping rates, steering feel, and yaw-control characteristics. Hyundai also showed off the base and turbo models, which will be available with either a six-speed manual or seven-speed dual-clutch transmission. Power in the base model comes from a 2.0-liter cylinder with 147 hp at 6,200 rpm (estimated) and maximum torque of 132 lb-ft at 4,500 rpm (also estimated). The Turbo model actually uses a smaller 1.6-liter engine with 201 hp at 6,000 rpm (estimated) and 195 lb-ft of torque from 1,500-4,500 rpm (estimated). Base and Turbo models will also have a drive mode selector, although the modes are limited to Normal, Sport and Smart for engine, transmission, and steering feel. All Veloster models are FWD and use an electronic Torque Vectoring Control system to help deliver power. On the inside, Hyundai continues to create upscale interiors with a premium infotainment system that offers various advanced connectivity features, including standard Android Auto and Apple CarPlay. A heads-up display is also available, which further improves the Veloster's tech-driven and sporty character. The heads-up display can show speed, navigation instructions, cruise control, Lane Departure Warning, and audio system information. The standard Veloster models are available in a variety of colors including Ultra Black, Chalk White, Sonic Silver, Thunder Gray, Sunset Orange, Racing Red, and Space Gray with various leather and cloth interior combinations. 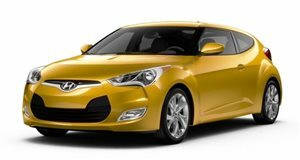 Pricing for all Veloster models hasn't been announced. Regardless of pricing, we believe that Hyundai has finally turned the Veloster into what it was always meant to be, a sporty hot hatchback that can back up its looks with insane performance.